Why We Love It: This app provides great stimulation for expressive and receptive language skills for children ages preschool through lower elementary (2nd or 3rd grade). 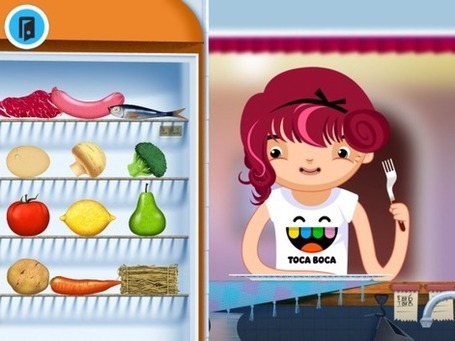 The player can choose a character to feed, and then can choose a food item from the “refrigerator”. The next step is to cook the food using a microwave, pot of boiling water, or frying it. The child can then chop the food using a knife on a cutting board or by placing it in the food processor. The language that can be elicited revolves around talking about type of food and food categories (i.e. “a lemon is a fruit” and “the sausage is a meat”), how to prepare the food, and whether the character enjoys the food. Each character has his/her own preference and will provide nonverbal information regarding whether he/she likes the food. Why Kids Love It: They can choose a variety of foods, even hay, to give to the characters. Most children love being able to cook the food and feeding it to the characters. The sounds the characters make help maintain the child’s interest.